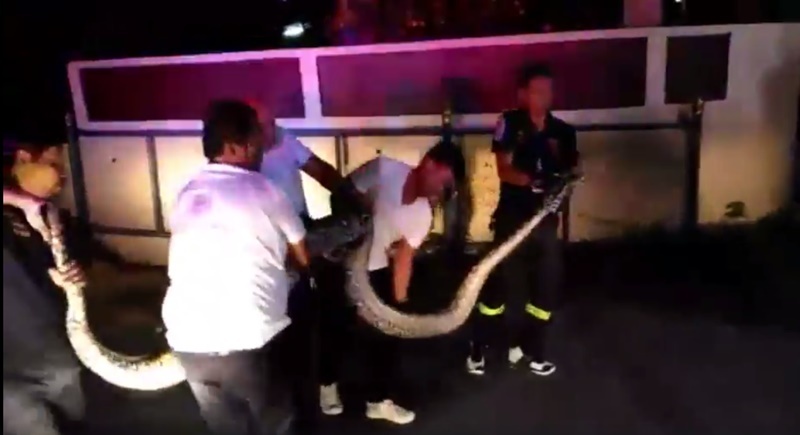 PHUKET: In the early hours of this morning, rescue workers successfully caught a 5-metre long reticulated python weighing 70 kilograms which locals found on a plot of land in Phuket Town. Kusoldharm rescue workers were notified by a local resident that a big python had been found near the Phuket Formal Education Centre on Damrong Rd in Phuket Town at 1:40am today (Oct 23) and went to the scene to find a five-metre long python under the centre’s name plate. About ten more rescue workers were called to assist with the capture with a big cage and it took the team 10 minutes to catch the python. Head of snake catching team of the Kusoldharm Foundation, Mr Poonsap Sae-eung, said, “The python was just over five metres long and weighed over 70kg.